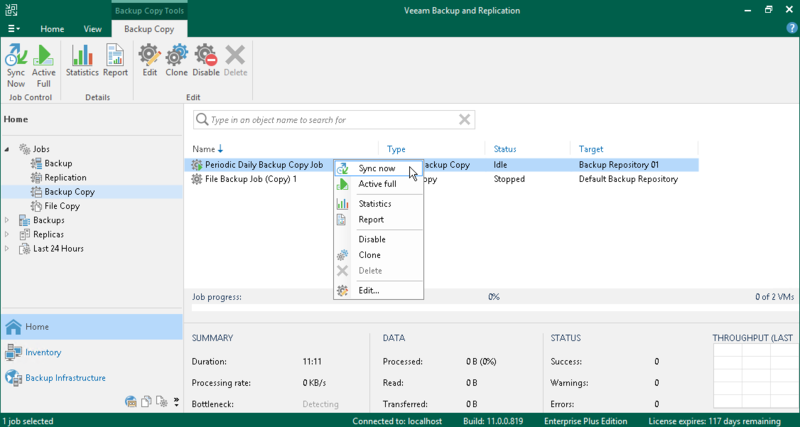 As soon as you create a backup copy job and start it, Veeam Backup & Replication automatically enables the job. Backups are copied between backup repositories automatically according to the specified backup copy interval. For more information, see Backup Copy Intervals. You can start the synchronization process manually. Manual start of the backup copy interval can be helpful, for example, if a new restore point has already appeared on the source backup repository but the previous backup copy interval has not finished yet. When you manually start the synchronization process, Veeam Backup & Replication creates a new backup copy interval. In case of backup copy jobs with minutely and hourly intervals, the backup copy interval is equal to those that are created automatically by the schedule. As a result, the start time of backup copy processing shifts forward. In case of backup copy jobs with intervals equal to one or several days, the day of the next backup copy interval shifts forward for the number of days equal to the interval. The start time of the backup copy interval, however, remains the same. For example, you configure a backup copy job to copy data every 30 days. The backup copy interval starts at 2:00 AM. The manual backup copy interval starts on May 1 at 1:00 PM. The manual backup copy interval will work from 1:00 PM on May 1 till 2:00 AM on May 31. On May 31 at 2:00 AM Veeam Backup & Replication will automatically start a new 30-day backup copy interval. In the inventory pane, select the Backup Copy node under Jobs. In the working area, select the backup copy job and click Sync Now on the ribbon or right-click the backup copy job and select Sync Now.